Los Angeles Academic of Arts and Enterprise is a school that has a student uniform policy. The school uniform dress code policy is a requirement that ALL students must follow, both high school and middle school. Student attire required is as follows: gray, white, or blue polo shirt with school logo; navy blue or black pants or jeans, not tattered, ripped or light in color. Leggings are not allowed. Students will receive a complimentary uniform set (polo shirt, physical education shirt and sweater) upon enrollment and submission of the lunch application. If you would like to purchase addition uniforms you may contact Ms. Nidya Vazquez in the Main Office. A Uniform Order Form is required along with payment. 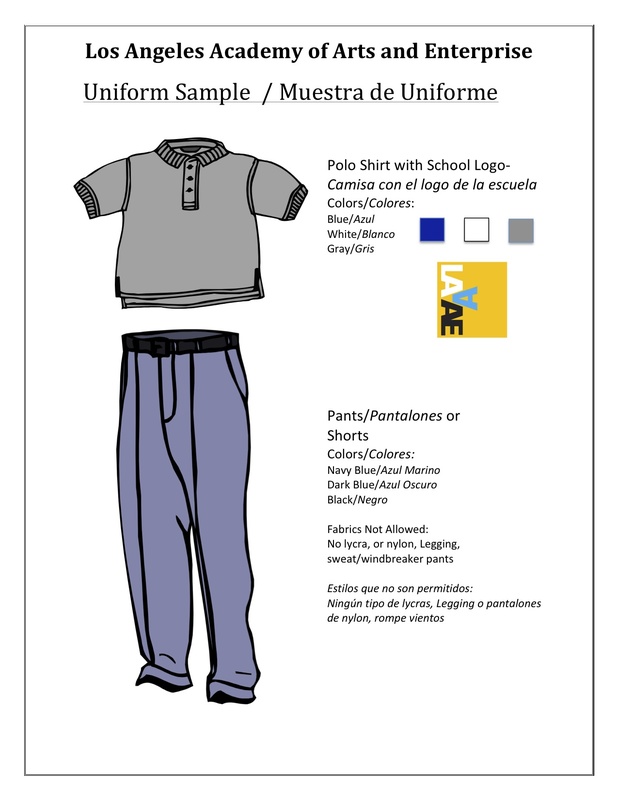 Uniform orders are available for pick up (with receipt) from Ms. Maria Bernaldez before and after-school only in the Faculty Lounge.